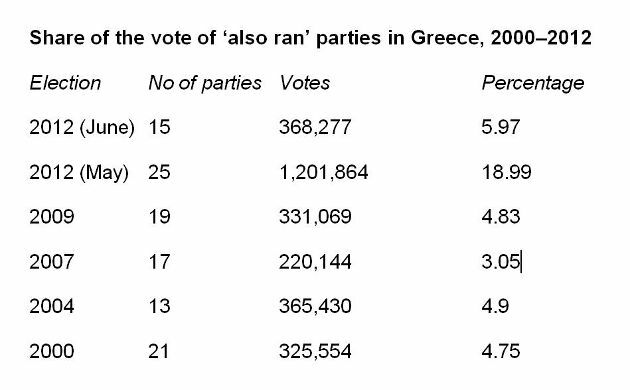 But under the Greek electoral system, determining whether the biggest party achieves an overall majority just doesn’t depend on its share of the vote, as important as that may be. One of the quirks of the system is that a host of other parties also play a major role in whether the main party gets to rule alone or not. The political equivalent of the “also rans” in horseracing, these are the parties that fail to clear the three percent hurdle to enter parliament. The aggregate of the “also rans” is always important because if the percentage gained by these small parties totals 5 percent, for example, the winning party would need 38.4 percent to take 151 seats. If the total support for parties not entering Parliament reaches 10 percent, the threshold for the victorious party falls to 36.4. The other words: the higher the share of the “also rans”, the easier it is for the poll-topping party to form a single-party government and avoid a coalition. While some of these parties are familiar, like the far-right LAOS party that was in parliament until 2012, most are so obscure that only hardened political anoraks will have never heard of them, like numerous groups sporting the word “communist” in their title or the fantastically named perennial contestant run by a farmer in northern Greece called “Independent Innovative Left, Renewed Right, Renewed PASOK, Renewed New Democracy, No to War, Party of Business ‘I Give Away Land, I Give Away Debts, I Save Lives,’ Panagriarian Workers Movement of Greece”. As previous results show, these parties are neither are they small in number, nor are the percentages they receive anything to be scoffed at. In the first of the elections in 2012, for example, a record 25 “also rans” won a staggering 1.2 million votes, or some 19 percent of the total. Taken together, that made them more successful than New Democracy, which took 1.19 million votes (18.85 percent). In the second election in June, the 15 of them who could afford to run again took 368,277 votes, or almost 6 percent. That was more than the communist KKE received and just less than Democratic Left, which won 17 seats. This time round, a total of 22 parties (including four coalitions) are running in the election. 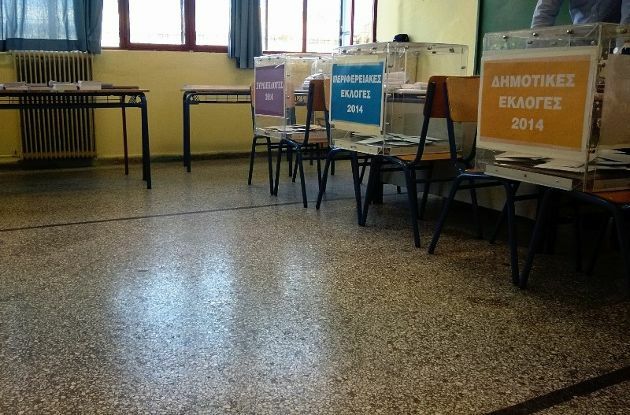 Assuming that seven of them will make it into parliament (Syriza, New Democracy, Potami, KKE, Pasok, Independent Greeks and Golden Dawn), recent opinion polls suggest that the “also rans” could take anything from 5 to 8 percent. Or even more. Pushing up the figure will be the share of the vote taken by former prime minister George Papandreou’s Movement of Democratic Socialists, leftwing antiausterity ANTARSYA, nationalist LAOS, and Democratic Left, all of which are not expected to make it into parliament. 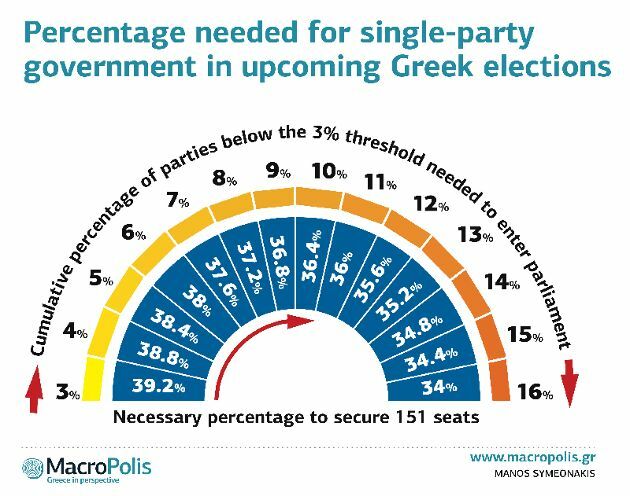 If the “also rans” do take between 5–8 percent, then Syriza – if Alexis Tsipras’ party emerges as the winner of Sunday’s election – would need 37.2–38.4 percent to go it alone. The formula is rather simple, based on the following rules: the winning party takes 50 of the 300 available seats as a "bonus". That means only 250 seats are proportionally distributed among the parties that manage to surpass the 3% threshold for entry. That last sentence is the key, especially the "among the parties that manage to surpass the 3% threshold for entry" part. For instance, if the "also rans" - those that do not surpass the 3% threshold - take 6% of the votes, only 94% is left allocated to the other parties, in other words 94% represents 250 seats. If the winning party scores 38%, it means 38% of 94% multiplied by 250 go to them. That's 101 seats, with the 50 bonus seats just enough to form a majority government. Other example: "also-rans" get 16% of the vote. Remainder of the votes = 84% is distributed over the 250 seats. Winning party needs only 34% of the votes to get [34% of 84% of 250 seats] = 101 seats to have a 151 seat majority. Stats aside, the fact remains that Syriza is a 100% Merkel creation and that these elections were forced fed by Berlin. Therefore the real question is why? What advantage Berlin saw by installing Syriza to power? The only logical explanation is so that they have an opportunity to crash them because otherwise you can't crash an opposition which remains in the shadows and refuses to participate.